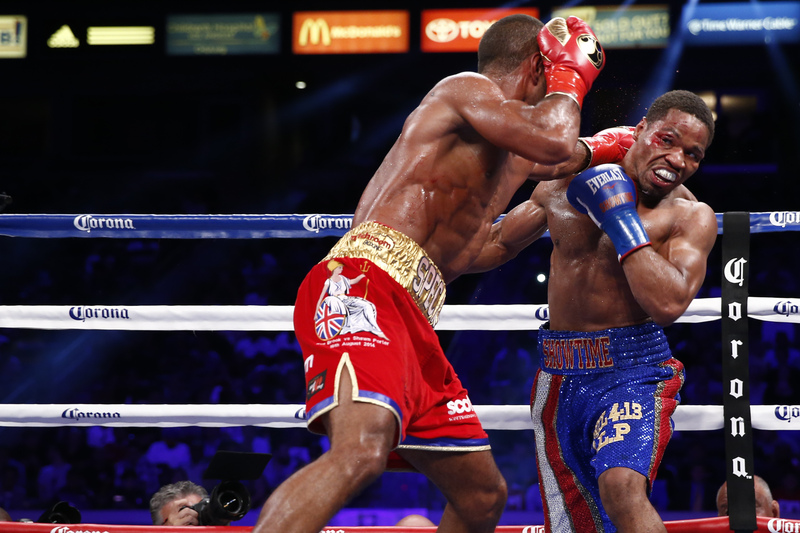 ‘The Special One’ Kell Brook ended years of frustration by capturing the IBF Welterweight title at the StubHub Center, Carson, California, USA, last night with a Majority 12-round decision over Shawn Porter. The fight was rugged and rough with both men cut from head-clashes; Brook in the second, Porter in the sixth. Referee Pat Russell allowed the boxers to fight on the inside, but the more aggressive Porter’s work was often smothered. Kell Brook (33-0) remained composed through-out the fight and often made space to land the sharper, cleaner punches. Neither man was ever in serious trouble but Brook did catch Porter on several occasions. The orthodox jab worked well, along with the sharp right hand from the challenger. Several rounds were difficult to score due to Porter’s pressure and volume against Brook’s more selected shots. The defending champion, making his second defence, seemed to fade down the stretch. I hadn’t picked Brook before the fight; but he was a worthy winner. 26-year-old Shawn Porter (24-1-1), suffered the first defeat of his career. The three judges had wildly different scores: Adalaide Byrd 116-112, Max DeLuca 117-111, both for Brook while English judge Dave Parris had it a 114-114 draw. I scored it 116-112 for the 28-year-old Sheffield boxer, who impressed and showed steel in dealing with the strength and aggression of the champion. The Dominic Ingle trained Brook, now has a lot of options for potentially big fights and was keen to mention the names of Floyd Mayweather and Keith Thurman, while suggesting that British rival Amir Khan needs to get in the queue. Brook has certainly achieved something special by joining Ted ‘Kid’ Lewis and Lloyd Honeyghan; in winning a ‘World’ welterweight title on American soil.